Silently passing the rest of the races of the galaxy by in their slowships, the Kesssoné are as enigmatic as they are dangerous. They have been observed, at the slightest provocation, to blast ships into oblivion with weapons that practically rival those of the Attheri. Image source: Ali-Rahimi.net. Click to see source page. No Kesssoné has ever been captured, at least not by anyone who has survived to tell about it. It is unknown whether their biology even remotely resembles that of either the humanoids or the Attheri of the Known Galaxy. Certainly, their logic does not. Of the extremely rare transmissions that have been received from a Kesssoné ship (transmission which were actually directed elsewhere, and picked up only by accident), nothing has been decoded or even found to contain patterns of the type that occur in humanoid/Attheri communications. It is not known what the Kesssoné seek to achieve on their slow, patient missions, although it is widely assumed that they are, either naturally or artifically, an incredibly long-lived species. It has been noted with great anxiety, however, that the frequency of their appearance in inhabited space has been on the rise in the past few years. 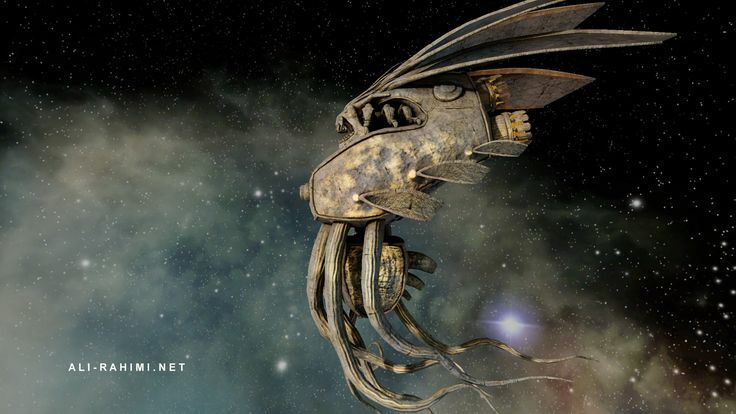 There is only a small group of scientists of all humanoid species (especially Humans, Aakaal, and Stethavini) called the “Kesssoné Inquiry Alliance” who actually attempt to study the strange species. They have met with extremely minimal success to date, and their numbers are continually thinning as chance encounters increase with these strange beings. However, most spacefarers have found that is easiest and wisest to simply avoid the Kesssoné at all costs.